Celebrate the incredible client-dog teams that have worked so hard to graduate from FSD. Join us for Faces of Freedom Sporting Clays Tournament in Denver. Join us for the 12th annual Doggie Plunge, presented by Baird. Join us for Faces of Freedom Sporting Clays Tournament in Midland, TX. Join us for the eighth annual Diamonds in the Ruff at the Hyatt Regency Denver Tech Center. We are grateful for the support of individuals, groups and businesses that hold events to raise funds and awareness to support Freedom Service Dogs! Below is a list of ongoing partnerships and community events that are being held on our behalf. For more information, or if you are interested in starting your own fundraiser, please start by filling out this form. Questions? Contact Nadine Pace at npace@freedomservicedogs.org. Calling all Target shoppers! Starting February 19th, and only through April 6th, you can now "cast your vote" for FSD to receive donations from Target. Every time you check out in stores or online, you can earn votes to help direct where Target gives. FSD is one of 8 charities in our region chosen to participate, so start voting now! To get started click here, head to your Target app on your phone, or sign into your existing Target account online. 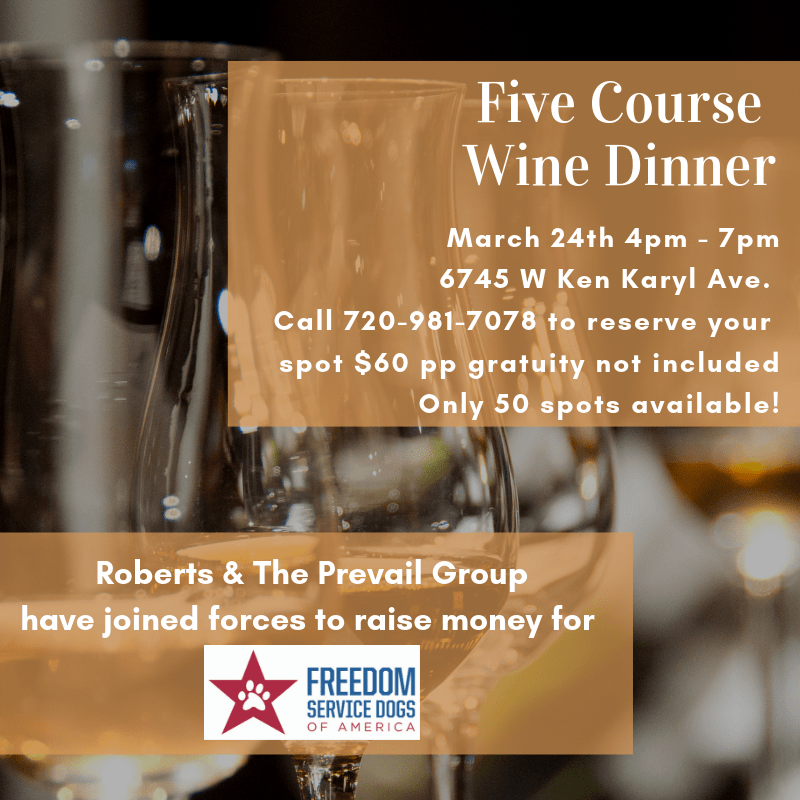 Join Roberts Italian Restaurant and The Prevail Group, LLC as they support the mission of Freedom Service Dogs with a Five-Course Wine Dinner on March 24th from 4pm - 7pm at Roberts Italian Restaurant in Littleton, Colorado. Reserve your spot now for $60 per person, not including gratuity. Check out the amazing menu! Space is limited to only 50 spots, so hurry and book now. Please call Roberts to reserve your spot at 720-981-7078. 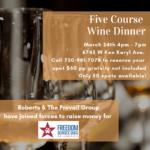 Order of the Eastern Star Heritage Chapter #154 is hosting a wine tasting and silent auction event to benefit FSD on Saturday, April 6th in Denver. For just $20 per person, you can sample 20 wines from around the world, while shopping for a cause at the fantastic silent auction. Click here for more information on how to get your tickets now! Join FSD at the Cabela's in Lone Tree, Colorado for a FREE "Dog Days" event on Saturday, April 27th from 11AM until 3PM. This family friendly event includes lots of fun activities like a free giveaway to the first 100 dogs, a free photo download with your pet, and a best trick contest at 1PM with first and second place prizes! 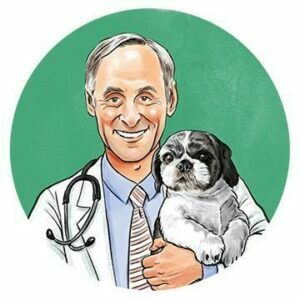 For over four decades, Dr. Marty has been a leading voice in veterinary medicine - and to some is called America’s foremost integrative veterinarian. Dr. Marty knows what your dog needs to stay its healthiest. That’s why Dr. Marty's premium pet food is always grain free, with multiple protein sources and essential vitamins and minerals to keep your best friend healthy and happy. Dr. Marty's Pets proudly supports the mission of FSD and has committed to donating a portion of each purchase of Nature’s Blend, Dr. Marty’s Premium Freeze-Dried Dog Food, between May 2018 and May 2019 directly to FSD. Keep your pup happy and healthy, while supporting FSD now! Have you been looking for a holistic solution to ease anxiety and stress for your pets? 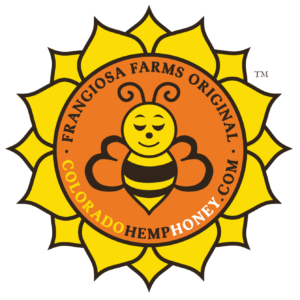 Local, veteran-owned business, Frangiosa Farms, and creators of Colorado Hemp Honey, has created another new product just for pets called Thera-Bee. This product combines three powerful ingredients to create a natural alternative for your pet’s anxiety and pain relief. Check out more details and order yours online now and 10 cents of every bottle purchased supports FSD! It's pretty easy to see how a dog is feeling based on their tail: happy, scared, sad, etc. A book called "If Only Humans Had Tails...and More Tales", co-authored by Vicki Medina and 9News anchor, Corey Rose, with photography by Sean McNeil of Dogs of Denver was designed to help children (and adults) express their emotions by relating to the beautiful photos of furry, four-legged models - some of which are from Freedom Service Dogs. You can order your copy now for a suggested donation of $10 each. 100% of the purchase price from each sale goes straight back to FSD. Play a part of a really good (canine) cause! With your purchase of any Good Goes Around high-quality products for your best (dog) friend, 25% will come back to FSD. Questions? Please check out Good Goes Around via their website now! Sit a Dog, Save a Life™ lets you raise money for local dogs-in-need by doing something you do already… asking your friends, family and neighbors to watch your dog while you travel, instead of leaving him in a kennel! Montana Winery has partnered with Freedom Service Dogs to create "Cargo's Crush" Red and White Blend wines, featuring FSD's ambassador, Cargo! For each wine pair sold, $8 will be donated back to Freedom Service Dogs. So go ahead, enjoy a glass of Cargo's Crush Red or White Blend and support the lifesaving mission of Freedom Service Dogs! Kuranda is a small, unique dog bed manufacturing company established in 1987 and based in Annapolis, Maryland. Kuranda created their Donate-a-Bed Program as a means to help provide comfort to shelter and rescue dogs. If you would like to donate a Kuranda dog bed to Freedom Service Dogs, please take a look at our wish list! TagsForHope is a company that makes a unique new kind of dog tag that never wear out. They hold vital medical and behavioral information; they are virtually silent; they are great conversation starters; and all TagsForHope tags come with a Life-Time Warranty so you never have to buy another tag for your pet, ever again! TagsForHope saves you money in the long run, and as a part of the TagsForHope's Partners Program, 25% of your purchase can help Freedom Service Dogs!